Albizia lebbeck (Siris) complete detail – updated. Description of Albizia lebbeck (Siris). Classification of Albizia lebbeck (Siris). 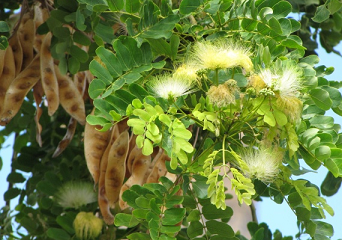 Medicinal uses of Albizia lebbeck (Siris). 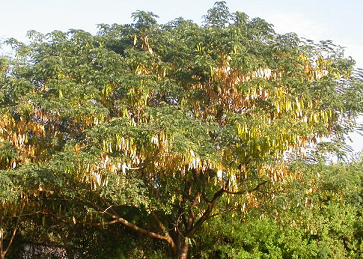 Albizia lebbeck used in Indian traditional medicine. The flower emollient is used as a poultice to be applied to boils. Albizia lebbeck used in Indian traditional medicine, particularly for asthma and allergic disorders. Albizia lebbeck is a deciduous, perennial legume tree, upto 25 meter in height, with grey fissured corky bark, somewhat flaky, inner bark reddish. Local name of Albizia lebbeck is Siris. Distribution of Albizia lebbeck. The wood of lebbeck is suitable for construction, furniture and veneer. Albizia lebbeck is a deciduous, perennial legume tree, upto 25 meter in height, with grey fissured corky bark, somewhat flaky, inner bark reddish. It is multi-stemmed when grown in the open but capable of producing a single straight stem when grown in plantations. The gray, cork-like bark is fissured and somewhat flaky. Leaves are Alternate, twice compound, with 2–6 pairs of pinnae, each pinna with 4–12 pairs of leaflets, leaflets elliptic-oblong, 2–4 cm long. Usually asymmetrical at base, dull green above, paler green below. Flowering and seeding occurs in the wet season, and unless the trees have been frequently coppiced, they will produce large amounts of seed every year. Flowers mimosa-like, in showy, rounded clusters near stem tips, 5-6 cm across, cream or yellowish-white, the numerous stamens are about 2 cm long. Inflorescences are globular clusters of 16-40 white fragrant flowers. 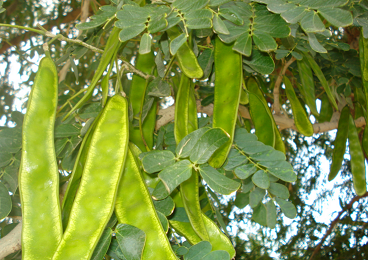 The fruits are 10-25 cm long and 3-6 cm broad, reddish-brown pods that contain 5-15 flat rounded, free moving seeds. 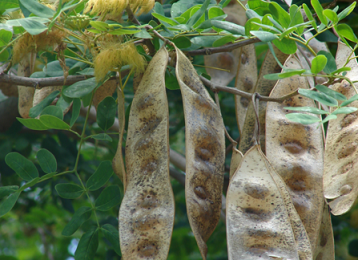 The pods are pale straw to light brown at maturity, narrow-oblong, papery-leathery, 15-25 cm long, 3-6 cm wide, swollen over the seeds and not constricted between them, indehiscent and borne in large numbers. Seeds are brown, flat, orbicular or elliptic, transversely placed with 4-12 in each pod. Albizia lebbeck occurs extensively throughout the Indian subcontinent and in Thailand, Pakistan, Bangladesh, the Andaman Islands, Burma, S China, NE Thailand, Malaysia and Malaysia. Albizia lebbeck is probably native to southern and south-eastern Asia and northern Australia, and possibly also parts of eastern Africa. Albizia lebbeck has many medicinal properties like Antiseptic, antibacterial, anti-allergic, antidermatosis, antidysenteric etc. Used in the treatment of Bronchitis, piles, hemicranias, cough, tropical pulmonary eosinophilia, asthma etc. Lebbeck is used as an astringent, to treat boils, cough, to treat the eye, flu, gingivitis, lung problems, pectoral problems, to treat abdominal tumors and it is also used as a tonic. The bark is used medicinally to treat inflammation. Albizia lebbeck is also psychoactive. The wood of lebbeck is suitable for construction, furniture and veneer. The flower emollient is used as a poultice to be applied to boils. The bark and seed astringent are used against diarrhea, dysentery and hemorrhoids. The seed yields oil used as a cure for leprosy. Albizia lebbeck used in Indian traditional medicine, particularly for asthma and allergic disorders. As a fodder tree, its foliage, twigs, flowers and immature pods are relished by different classes of livestock. Albizia lebbeck also used as a source of firewood and timber for local peoples.